The Leper hospital of St Mary Magdalen was founded in or around 1180 on the Alresford road about a mile from the city of Winchester. Medieval hospitals were diverse institutions. Far from being the medical institutions we have today, they often operated more like hostels catering for certain social groups such as the poor, the blind and people afflicted with leprosy, a particularly nasty affliction. Many operated very much like monasteries and some, such as Winchester, also held lucrative markets and fairs. The hospital at Winchester was dissolved in the sixteenth century but parts of its structure remained until the eighteenth century. 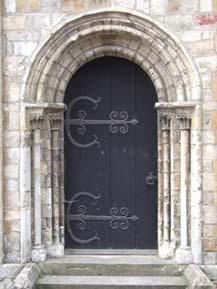 At this time, some of the hospital’s features were removed and incorporated into new buildings in the city including an elaborate Norman doorway which can be found at St Peter’s church. Today, the site consists of open fields with nothing existing above the ground. However, archaeological investigations by Channel 4’s ‘Time Team’ revealed that much of the hospital foundations; its chapel, accommodation and extensive cemetery remain unexcavated and it is this that forms the focus for the Department’s excavations from September 2008 onwards. Little is known about the layout of medieval leper hospitals and the University’s work on the site provides students with a unique opportunity to explore one of medieval England ‘s more unusual religious institutions. First year students are currently investigating the site of the Leper hospital in a programme of surface survey. 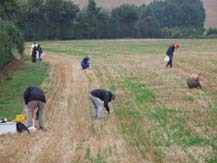 On 24 August 2008 the Department will begin a four week long excavation of the site. Although undertaken primarily for research purposes, the excavations will also be the Department’s undergraduate and MA training project. There will also be an opportunity for those who are not our students to participate either for just a day or two between 1-5 September as a taster of what field archaeology is all about. Alternatively students/volunteers can take part for a longer period of time in the interval 24 August and 20 September 2008.